Syracuse & Connecticut: Did You Know We've Met Before? What a game yesterday as two teams battled for "New York's College Team" bragging rights inside Madison Square Garden. St. Johns, who plays their home games in MSG versus Syracuse, who plays their "home" games in MSG. After forty minutes of battle on Thursday afternoon in the Quarter Finals of the Big East Tournament, the Syracuse Orangemen prevailed behind 22 points from Brandon Triche and 12 points from Fab Melo (a career high). With the score tied 68-68 and 2:24 remaining in regulation, Fab Melo decided that now would be a good time to take over. Melo scored four of Syracuse's next six points, including a layup with 31 seconds left to put the Orangemen up by 4, and Brandon Triche continued to be money from the foul line to ice the win for Syracuse. St. Johns was up 5 at halftime, however in the second half Triche and Joseph helped will the Syracuse squad to victory. Triche was a perfect 8/8 from the foul line, including 4/4 in the last 18 seconds of the game to seal the victory. Rick Jackson just missed another double-double, finishing with 10 points and 9 rebounds, along with 4 assists, 3 steals and 4 blocks. Six of Jackson's ten points came in the last 7:13 of the game. Jackson came up big when Syracuse needed him most, just like you would expect your senior leader to do. Earlier in the day, Kemba Walker sent UCONN into the semi-finals with a game winning buzzer beater as time expired to knock off #3 Pittsburgh 76-74. The bucket gave Walker 24 points in the game and put Syracuse and Connecticut on a collision coarse to meet tonight at 7PM in the Semi-Finals of the Big East Tournament. Now, some of you may remember a little game that was played way back in 2009 that featured these two teams on the very same court. Eric Devendorf, the poster child for good behavior, drilled a three pointer as time expired to give Syracuse what appeared to be an epic, epic victory over the hated Huskies. After a long review it was determined that Devo did not get his shot off in time and the bucket was wiped, sending both teams into overtime. Personally, I feel that if the game clock went to hundredths of a second (0.01) the shot would have counted. Be that as it may, that unbelievable shot set the stage for the greatest game in Big East Tournament history. Now I'm not sure how many times ESPN will be flashing the highlights from that fateful night between now and the 10 hours that lead up to game time, but I'm sure that it's going to be often! Not to mention the number of times it will be referenced during the game! Any time the score is tied in the second half, the ESPN talking heads will surely say "better not walk away we may have another six overtime game here!" After the third overtime, it was apparent that whoever lost that game was going to live with it for the rest of their lives. If you win, you're selling t-shirts, DVDs, hats, and going on David Letterman. If you lose, than every single time someone talks about the six overtime game you are going to hang your head and talk about what might have been. Johnny Flynn declared for the draft shortly after and got himself into the NBA Lottery, mainly because of his performance on that night. The next few weeks all anyone could talk about was the epic six overtime finish in the Garden. Syracuse became the nations darling. Everyone was picking them for the Final Four and the country fell in love all over again with Jim Boeheim. And now we meet again. Will it go to six overtimes? Most likely not. Will it be a nail-bitter down to the wire? Quite possibly. The only time these two teams met this year was in Hartford, CT when then #17 Syracuse was in the midst of a four game losing streak and Connecticut was ranked #7 in the country coming off a six game winning streak that was just ended by a double overtime loss to Louisville. Today at 7PM in Madison Square Garden Syracuse and Connecticut will tip off at 7PM and then 30 minutes after whenever that game ends Notre Dame will meet Louisville in another game that's sure to be a classic. What a night we have coming up at Madison Square Garden! Just got back from the Big East Tournament and boy what a day it was! First Connecticut blew the doors off of Georgetown 79-62, and it wasn't even that close. 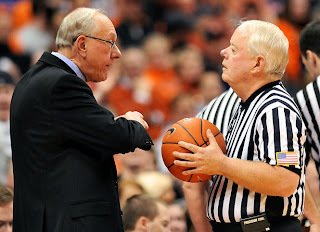 Then St. Johns let Rutgers hang around for 38 minutes before Jim Burr and Tim Higgins proved to the nation that they were the worst officials in the game today. Possibly even the worse two officials in any sport at any level! Do you think this is the first bad game either of these guys have had? No. They make mistakes like this all the time, and this time it was on national TV during the Big East's marquee event. Tim Higgins and Jim Burr, taken separately, are two of the worst officials in the NCAA, that's a given. Put them together on the court, and that's recipe for complete disaster. And disaster is what they got inside the Garden today, as time wound down on the second game of the Wednesday afternoon double-header. After an errant inbound pass bounced to Justin Brownlee CLEARLY stepped out of bounds with 1.9 seconds left on the game clock. No whistle. He then threw the ball into the stands. It looked to me like there was still time on the clock, because from my seats I hadn't heard the buzzer ring out yet. From section 202 it was devastatingly obvious that there was still time left on the clock. For two referees who couldn't officiate a game of darts in an Irish Pub, it was business as usual. Game over. St. Johns wins and moves on to play Syracuse tomorrow at 2:30PM in the quarter finals. No review, no discussion. Mike Rice was so busy arguing about a blatant non-call from earlier didn't even realize that there was still time on the clock when Brownlee obviously took two full steps out of bounds with time on the clock. And that leads us right into tomorrow. The Syracuse Orangemen, currently ranked #11 in the nation, will take the court they call home against #17/18 St. Johns, who also call Madison Square Garden home. Meanwhile, the Red Storm also call Carnesecca Arena home. Be that as it may, it will certainly be a battle for who owns the rights to the Garden. Syracuse has been running St. John's house for what seems like decades. We have been going into their house after running through the mud, leaving our shoes on. Rubbing the mud into their carpet. Drinking out of a glass and not using a coaster on their coffee table and blasting the music all hours of the night when all St. Johns wanted to do was go to sleep. Syracuse fans turn up in droves in Madison Square Garden at a rate that St. John officials can only dream of. Even with a rejuvenated St. Johns program, Orange will still outnumber Red inside MSG tomorrow, just as it did back on January 12th when Syracuse beat the Johnnies 76-59 behind 18 Kris Joseph points and a double-double from Rick Jackson. Syracuse led that game by as many as 22 points. So tomorrow, expect an angry St. Johns team. Expect a team that's tired of having a house guest. A guest that's been nothing but rude to them. A guest who has repeatedly beaten them and other nationally ranked programs on the very same floor they consider a home court, while their own program sputtered into irrelevance. Expect a team that wants to set the record straight that Syracuse no longer owns MSG and no longer owns NYC. Fortunately for Syracuse, we have been here before, and we will be ready for anything Steve Lavin and St. Johns throws at us. Way back on November 12th Syracuse began their 2010-11 basketball season with a victory over Northern Iowa. The Orangemen went on to rattle off 17 straight wins to give the University the 2nd best start in school history, 18-0. With a chance to tie the best start in school history, then #3 Syracuse let then #4/#5 Pittsburgh run out to a 19-0 lead before storming back with a 17-0 run of their own to open the game on January 17th. The Orangemen dropped that game 74-66, and then lost three more in a row putting their season on the brink. With the team in danger of losing five games in a row for the first time in Jim Boeheim's coaching history, the Orangemen (who had fallen to 17th in the nation) woke up and delivered a huge win in Connecticut (then ranked #6 in the country) 66-56 behind Rick Jackson's 15th double-double of the season (13 points 13 rebounds). That win ultimately saved the Orangemen's season, and helped spur the Orangemen on to their current four game winning streak. Now, we are ranked 12th in the nation, and with a win today Syracuse can earn a double bye in the Big East Tournament which begins this week in New York City. The Orangemen have matured a lot over the course of the season, and today we gather in the Carrier Dome to say goodbye to one of our own. Earlier this week we discussed Rick Jackson, the lone member of the 2007 recruiting class that has used up all four years of college eligibility. Donte Greene left after his freshman season, Jonny Flynn left after a dramatic sophomore campaign and Scoop Jardine sat out the 2008-09 season following knee surgery. Leaving just Rick Jackson to be honored before tip off today at 4PM when Syracuse takes on the DePaul Blue Demons. It will be the last time Rick Jackson takes the floor in the Dome in an Orange and Blue uniform. There is some speculation that he may not be the only Syracuse player to play his final game in the Dome today, however. At the start of the season, there was a lot of chatter about Kris Joseph's name being called at the 2011 NBA Draft. While he may not have lived up to the hype coming into this season, Joseph is the leading scorer on the #12 ranked team in the nation, averaging 14.3 points per game. While I don't think Kris Joseph should leave for the NBA draft after this season, in today's environment I would not be at all surprised if he did. A lot will depend on his performance in MSG this week and the NCAA tournament. If he has a strong March and takes Syracuse deep in the tournament, than today will certainly be KrisJo's swan song at the Carrier Dome. DePaul comes to the Carrier Dome sporting a 7-22 overall record and just 1 win in 17 games in Big East play. The odds are certainly in Syracuse's favor to win today. Even the most die hard DePaul fan (those exist right?) will tell you that this game is going to be all Orange. So assuming that the Cuse hold court today, the Orangemen will earn a double-bye in the Big East tournament and play their first game on Thursday in Madison Square Garden. As a four seed, the Cuse will play at 2PM against the winner of the 5th overall seed (likely St. Johns) against the winner of the 12th v. 13th seed match up (currently Rutgers v. Seton Hall). DePaul has shown some signs of life of late despite their dreadful record. The Blue Demons lost 77-75 to Villanova at home on February 19th and two days earlier defeated the Providence Friars on the road, which is no small feat. DePaul also lost by 4 points in the YUM! Center in Louisville, Kentucky and lost by only three points against Cincinnati three days after the Louisville game. So while DePaul is awful, they can't be taken too lightly. A player to watch for Syracuse will be Scoop Jardine. Scoop, who averages 12.6 points and 5.9 assists per game has struggled much of January and February. However in Georgetown on February 26th Scoop put together the most consistent game he's played in quite some time. Jardine finished with 17 points 7 assists and just one turnover in 34 minutes on the floor. It was the first time since December 18th against Iona that Scoop turned the ball over just once. With the Orangemen getting hot down the stretch, now would be a TREMENDOUS time for Scoop to find the game he lost for January and February and get the team clicking on all cylinders heading into March Madness. Be sure to check back in with The Cuse Connection following the game for complete recap and analysis. The game begins at 4PM and will be televised live on SNY. We will also be previewing the Big East Tournament this week and will be tweeting live from Madison Square Garden and all the surrounding festivities as Championship week rolls on. Follow us on twitter @CuseConnection to get all the pictures, rants, raves, and opinions as they unfold! Ladies and gentleman, mark your calendars. Rick Jackson is the lone senior on the Syracuse Orangemen basketball team. 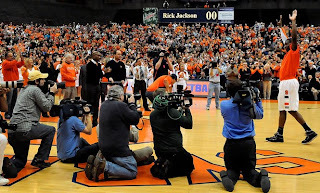 So, in honor of the final home game of the season, the Carrier Dome will be hosting Rick Jackson Night starting at 4:ooPM on March 5th, when Syracuse plays host to the DePaul Blue Demons. 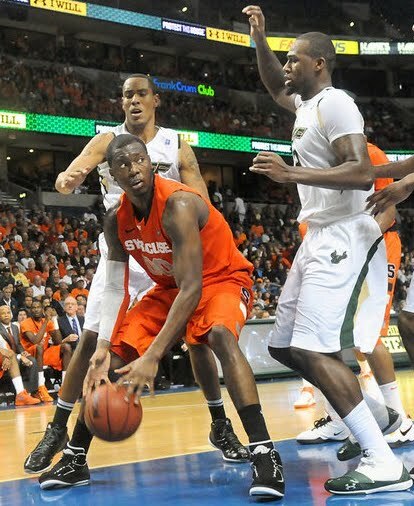 Jackson came to Syracuse in 2007 in a big four man recruiting class. Rick Jackson was joined as a freshmen with Donte Greene out of Towson, MD, Jonny Flynn out of Niagara Falls, NY and Scoop Jardine out of Rick Jackson's hometown of Philadelphia, PA where both players attended St. John Neuman High School. After Scoop Jardine's freshman season it was revealed that he was playing with a stress fracture and it would require surgery. This earned Jardine a medical redshirt, and saved him a year of eligibility. Scoop Jardine sat out the entire 2008-09 season. Donte Greene came to Syracuse as an extremely highly touted recruit out of Towson Catholic High School and was a McDonald's All-American. Donte Greene averaged 17.7 points per game during his freshman year at Syracuse and also picked up 7.2 rebounds per contest. Despite shooting 34.5% from three-point range, Greene relied heavily on the outside shot and spent most of the season around the perimeter. In spite of the team's shortcomings (did not qualify for the NCAA Tournament and lost to Massachusetts in the 2nd round of the NIT in the Carrier Dome), Donte Greene declared for the NBA draft following his freshman season and was taken 28th overall by the Memphis Grizzlies. He was traded that night to the Houston Rockets before being dealt to the Sacramento Kings, where he currently plays. Jonny Flynn played two seasons at Syracuse (2007-08 and 2008-09) before declaring for the NBA Draft and being taken 6th overall by the Minnesota Timberwolves. Jonny Flynn's draft stock skyrocketed following Syracuse's epic 6-overtime game against UCONN in the Big East Tournament, a game that saw Flynn play 67 of 70 minutes and finish with 34 points (16/16 from the foul line). Many believe that if not for the six overtime classic, it is very likely that Flynn would have returned for his junior season. This leaves just Rick Jackson as the lone player from the 2007 recruiting class to be honored Saturday before tip off against DePaul. Rick Jackson is one of those special players who significantly improved each season for Jim Boeheim's Syracuse Orangemen. During Jackson's freshman season he appeared in all 35 games without making a single start. Jackson shot 52.6% from the field while averaging 3.7 points and 3 rebounds per game while backing up Arinze Onuaku and Kristof Ogenaet. Jackson also blocked 44 shots that season. Jackson's sophomore season began with him assuming a key role off the bench. Rick's improved footwork from his freshman to sophomore season was extremely noticeable and it showed on the floor. Rick increased his playing time from 12.9 to 22.1 minutes per game and doubled his scoring and rebounding to 8.3 points and 5.8 boards per game, earning a few starts along the way in the process. Jackson blocked 76 shots his second season, 22 more than the previous year. He also nearly doubled his assists and steals, going from 19 assists and 15 steals to 36 helpers and 34 steals. Jackson's improvement from his sophomore season to his junior season was another big step in his development. This year, seniors Arinze Onuaku and Andy Rautins helped guide the Cuse to a #1 ranking in both the AP and ESPN/USA Today Coaches Polls. Rick Jackson stepped up his own game, averaging 9.7 points and 7 rebounds per game while shooting 59.1% from the field. Jackson's defense also improved, blocking 69 shots and stealing 36 balls while dishing 60 assists inside (24 more than his previous season). This season's version of Rick Jackson is a slimmer, stronger, and more determined Rick Jackson than Syracuse fan's have ever seen. Jackson has put this Syracuse squad on his back for most of the season, leading the Cuse to as high as a #3 national ranking prior to the mid-season slide. Through it all, Rick Jackson has played more minutes than ever before. Rick has seventeen double-doubles in thirty games this season. He had seven double-doubles his first three seasons combined on the Hill. Furthermore, Rick Jackson is currently leading the Big East in rebounds per game with 10.8. The next nearest Big East conference player is Oriakhi on Connecticut who averages 8.7. Jackson also leads the Big East in field goal percentage and blocked shots. Jackson is making 59.1% of his shots from the floor, 4.2% higher than Terrence Jennings of Louisville who is second and has blocked 73 shots this season, eight more than John Flowers of West Virginia who has played in three less games. Rick is also 4th in the Big East in minutes played with 35.4 minutes on average and is 20th overall in scoring with 13.1 points per game. Rick is the main reason for Syracuse's 18-0 start out of the gates, and his steady play on both offense and defense has certainly carried the Orangemen to their 24-6 (11-6 Big East) record. He's 2nd on the team in scoring and is one of the most reliable players on the floor. When Rick Jackson takes the floor for the final time inside the Carrier Dome on Saturday, he will be able to look back on a solid four year career at Syracuse, however his time in Orange will not be over. There is still the Big East Tournament in Madison Square Garden and then there's the NCAA Tournament. With so many big games potentially remaining in Rick Jackson's collegient career, we won't be saying good bye to the big man just yet. The Scoop Jardine that many of us had grown accustomed to watching last season finally reappeared in a Syracuse uniform after disappearing for much of January and February. Playing in front of 20,276 fans in the Verizon Center (the most ever for a Georgetown game), Scoop Jardine led the Orangemen to a 58-51 victory with 17 points and 7 assists, while turning the ball over just once in 34 minutes on the floor, spoiling "senior day" for the Georgetown seniors. The Orangemen pushed their first half lead from 3 points to 10 points at the break behind unbelievable play from sophomore James Southerland. 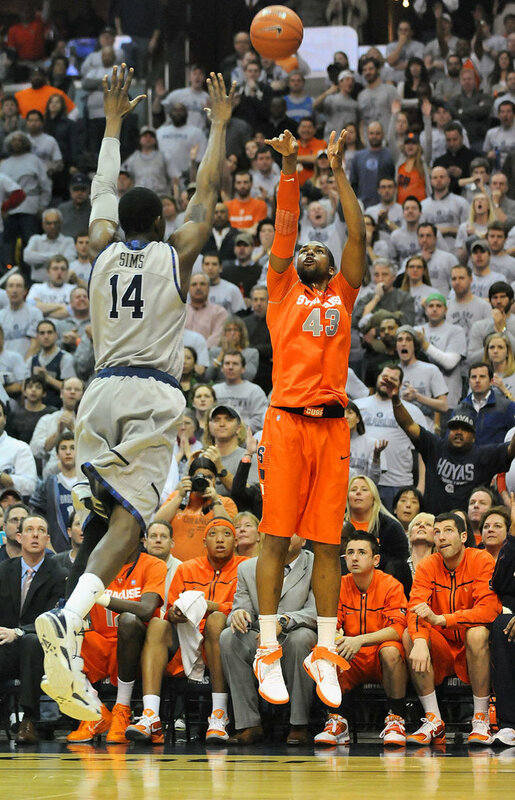 Southerland scored seven of Syracuse's final nine points of the half. James hadn't scored a single point since February 5th at South Florida, when he chipped in 2 points in one minute. Southerland received 21 minutes, more than he's played in the last eight games combined (three of which he did not play a single minute), largely due to the fact C.J. Fair was limited to just 11 minutes of action. Fair, who has played more than 25 minutes in each of the last six games, rolled his ankle in first half action against Villanova on Monday night. Although he did return to the game and go on to play 30 minutes that night, it was very clear that Fair was still feeling the effects of that injury. C.J. Fair finished with 4 rebounds and zero points. This was the first time this season that C.J. Fair appeared in a game and did not score a single point. Southerland, who scored 9 points in the first half, did not score in the second half. Considering C.J. Fair's lack of availability, the Orangemen's defense looked in control much of the game, minus Georgetown's surge when they went on a 20-6 run to take their first lead of the game since 2-0. With the score 45-43 with ten minutes remaining in the game, Scoop Jardine played his best minutes down the stretch of any game in literally weeks, making clutch shots and knocking down a HUGE 3-pointer shot with 4:53 remaining to put Syracuse back up six points. Rick Jackson, who will be playing in his final game in the Carrier Dome this coming Saturday, finished with 12 points on 5 of 7 shooting from the field and grabbed 7 rebounds. 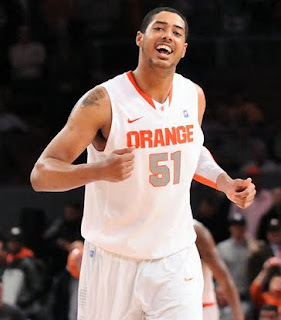 Fab Melo played his first significant minutes since missing practice prior to the Louisville game on February 12th. Melo played 7 minutes (more than his previous five games combined) and finished with 2 points and 1 rebound. Kris Joseph was limited to just 4 points on 2 of 7 shooting in 31 minutes and pulled down only 2 rebounds. This was his lowest offensive output since scoring 2 points in 10 minutes against Cincinnati before leaving with a head injury in the first half. The Syracuse Orangemen as a unit are peaking at exactly the right time of the year. After suffering four straight losses and losing six of eight games between January 17th and February 12th, Jim Boeheim's Orangemen have won 4 straight games. 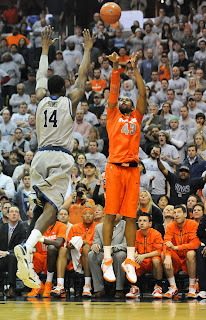 The last two victories coming in Philadelphia against #14/15 Villanova and in Washington D.C. against #11 Georgetown. Next up on the schedule is Rick Jackson Night, the final home game of the season against the 7-21 (1-15 in Big East) DePaul Blue Demons on Saturday March 5th at 4:00PM. It's Senior Day in the Carrier Dome, and the Orangemen faithful will be paying homage to their lone upperclassman, Rick Jackson. The 2011 Syracuse Football Schedule is Here! For those of you still basking in the enjoyment and excitement of the Pinstripe Bowl at Yankee Stadium (and as you can tell by this picture, Nancy Cantor is certainly still celebrating), it's time to dust off your trusty 44 jersey, grab your helmets and get ready for the 2011 Syracuse Football schedule which was released today!! As promised, Daryl Gross will be delivering the Syracuse Orangemen Football team he built from scratch to the red carpets of Los Angeles to take on the USC Trojans. The game will be played on September 17th at the LA Coliseum. Syracuse will also be taking the show to Bourbon Street to take on Tulane on October 8th. If you like traveling for Syracuse Football games, this is definitely the non-conference schedule of your dreams (and your liver's nightmares). Doug Marrone's Syracuse Orangemen have even been invited to play a college football game on a FRIDAY NIGHT. November 11th against the University of South Florida in the Carrier Dome.